A quarterback in college, Cappelletti was undrafted by the NFL and played semi-pro football in Canada before failing in a preseason tryout with the Detroit Lions. After sitting out all of 1959, he made the Patriots of the new AFL as a defensive back and placekicker. He intercepted four passes but was successful on just 8 of 21 field goal attempts. Cappelletti was shifted to split end on offense for 1961. Patriots went 9-4-1 to finish second in the AFL Eastern Division while ranking second in the league in touchdowns (52, tied with San Diego) and scoring (411 points). 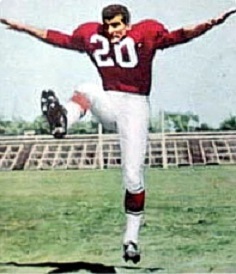 Cappelletti scored 128 points in 1962 and again led the league with 113 in ’63 (and also again in field goals with 22). He was named an AFL All-Star for the second time. Slow but sure-handed, he caught a career-high 49 passes for 865 yards and 7 TDs in 1964 while again topping the circuit with 25 field goals and in scoring with 155 points. He received AFL Player of the Year honors from the Associated Press and UPI. Cappelletti led the AFL in scoring over the next two seasons as well (132 points in 1965, 119 in ’66), for a total of five times in all, and had the league’s best field goal percentage in ‘65 (63.0). He was named to the league All-Star game after the ’65 and ’66 seasons. Cappelletti played a total of 11 seasons, all with the Patriots, and scored a total of 1130 points (his 1100 points in the AFL were the most in league history), with a total of 42 TDs, 176 field goals, and 342 extra points. One of 20 players who were in the AFL for all ten seasons, he also finished with 292 pass receptions for 4589 yards.